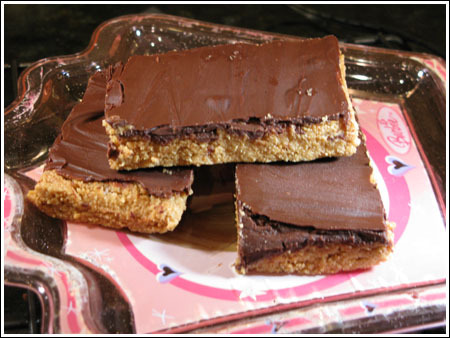 No-Bake Peanut Butter Bars taste like Buckeyes or Reese's cups in bar form. This recipe includes a dash of cinnamon for extra flavor. Mix the crumbs with the cinnamon. Set aside. Melt the butter in a large saucepan or in a microwave-safe bowl. Combine melted butter, peanut butter and vanilla and stir until fully blended, then stir in the graham cracker crumbs. Add the powdered sugar 1 cup at a time and taste test at 2 cups. You may not want to use the full 3 1/2 cups, but you'll need to use enough to make a stiff dough. Press mixture into the pan. Melt the chocolate chips in microwave using 50% power and stirring every 30 seconds or in the top of a double boiler set over barely simmering water. Pour melted chocolate over peanut butter mixture. Chill for one hour. Do not chill too long or the chocolate will get too hard to cut. When the chocolate is set but not completely hard, lift from the pan and cut into small squares.